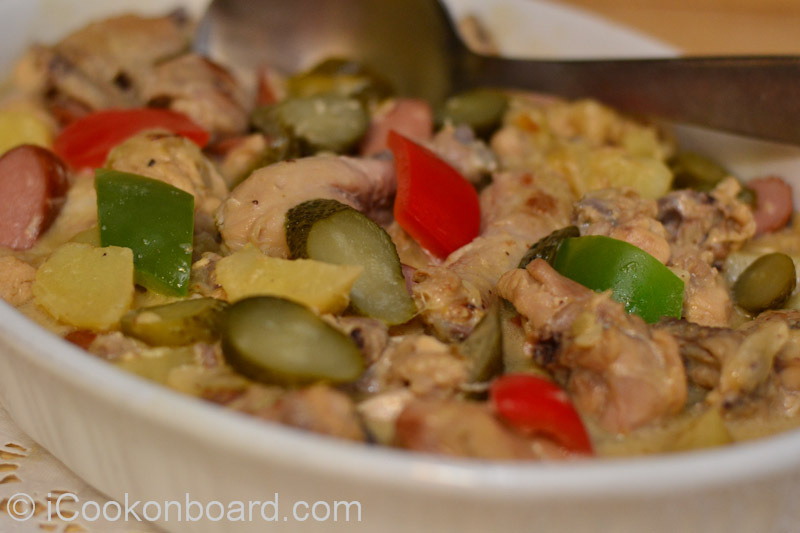 This chicken dish is a local recipè of my hometown Biñan, now a busy city. I learn this recipè from my Mommy Bing. I got my passion in cooking from her and I must say she’s one of my cooking heroes. This dish was never absent in every Fiesta celebration, our patron saint San Vicente Ferrer celebrates a feast every 5th of April. 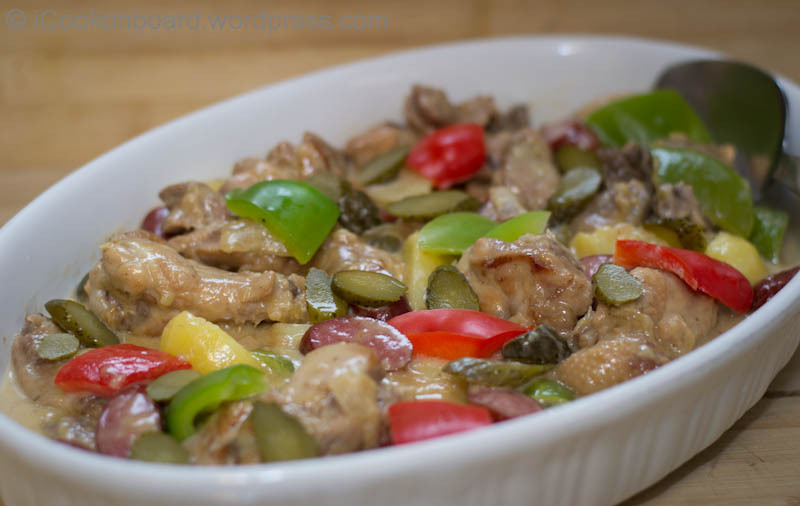 You’ll gonna like the creamy sweet tangy taste of this dish and its so easy to prepare and cook. Heat a large heavy bottomed stainless pot on very high heat. 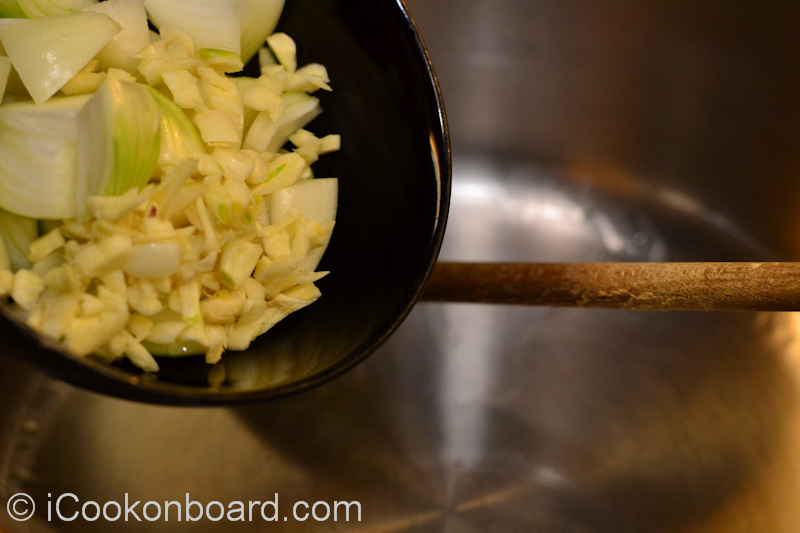 Pour oil, saute garlic and onions. 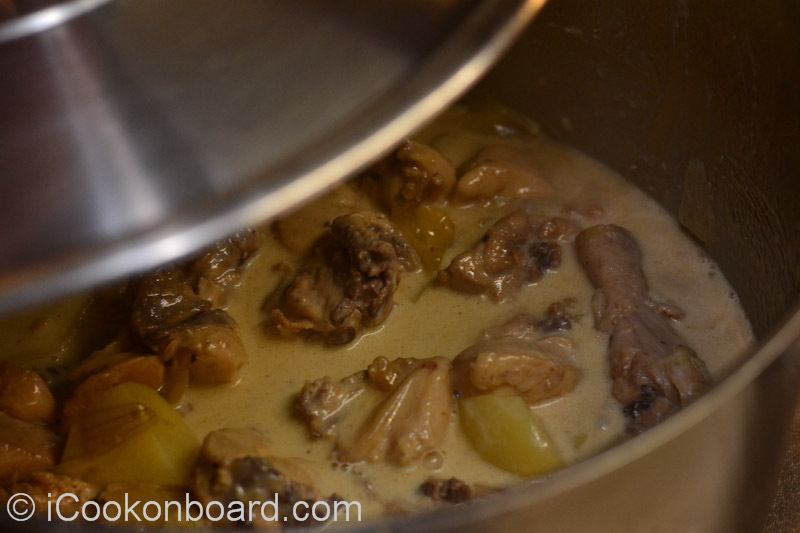 Stir garlic and onions for awhile, then add chicken and bayleaf. Stir and cover for 2minutes. 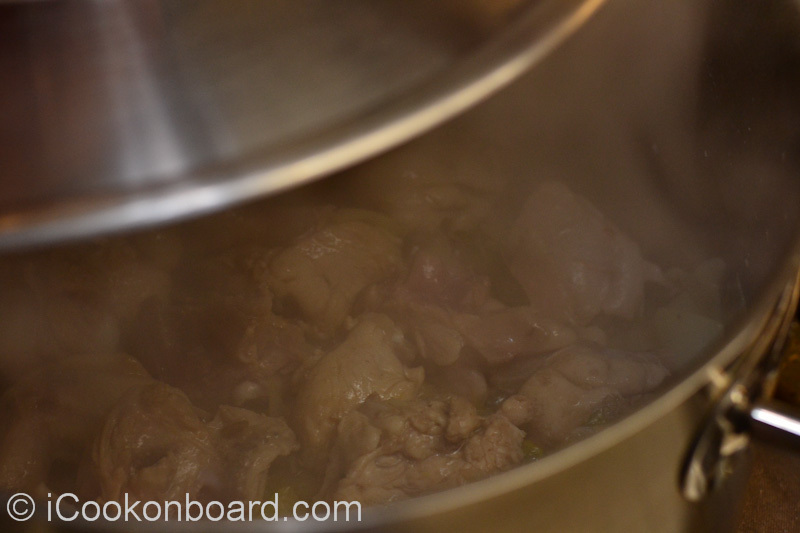 Pour fishsauce and stir chicken, return lid and cover for 3minutes. 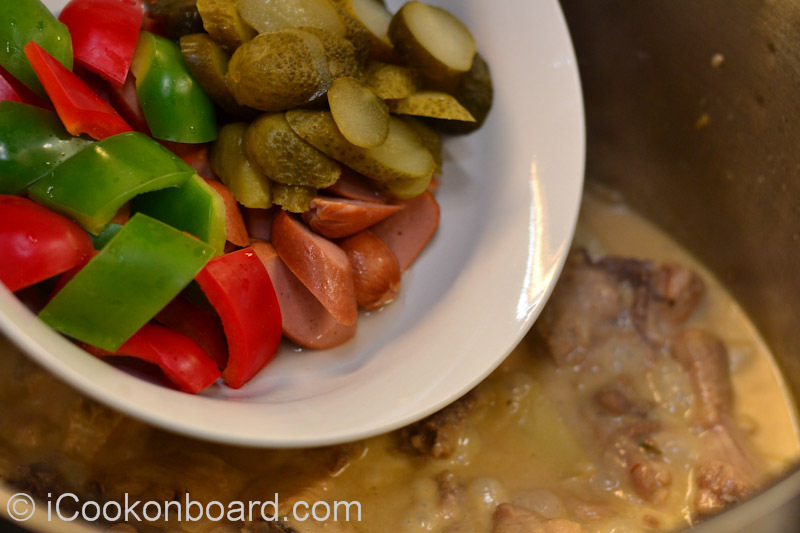 Reduce heat to medium-high, pour the juice of sweet whole pickles. Cover for another 10 minutes. 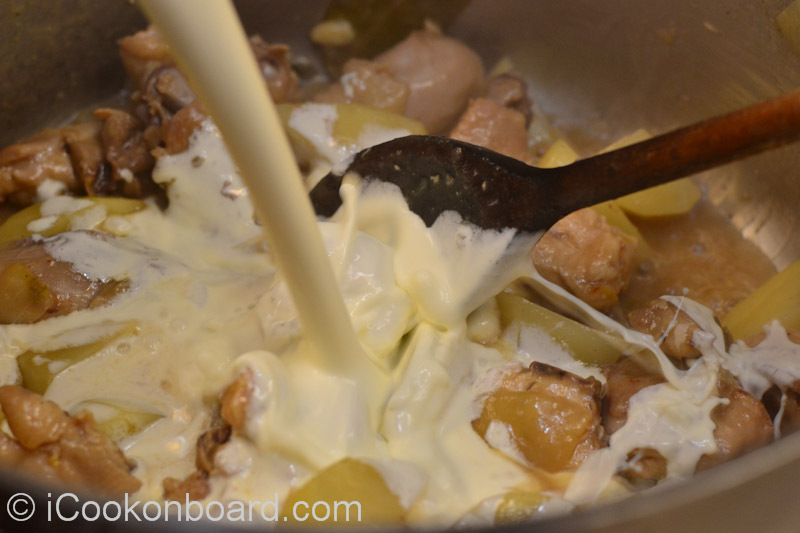 Add potato and cream, cover and turn heat to low. 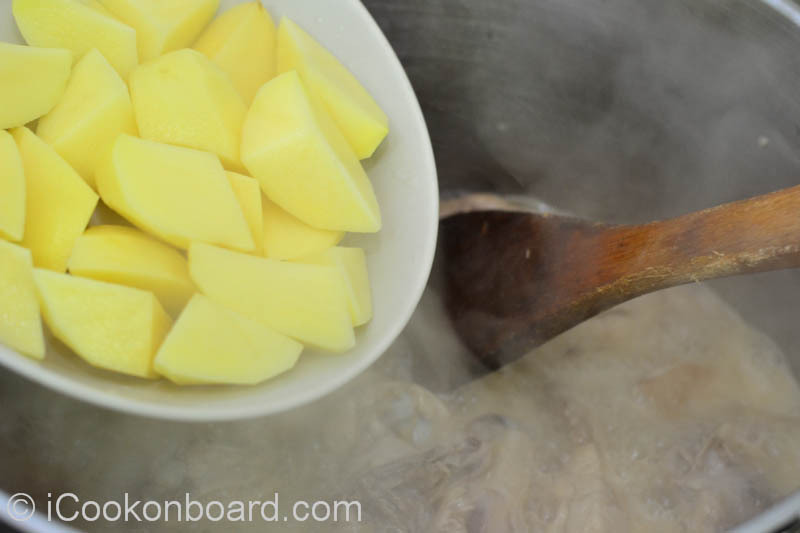 Potatoes will be soft and ready in 10minutes. Add the rest of the ingredients. 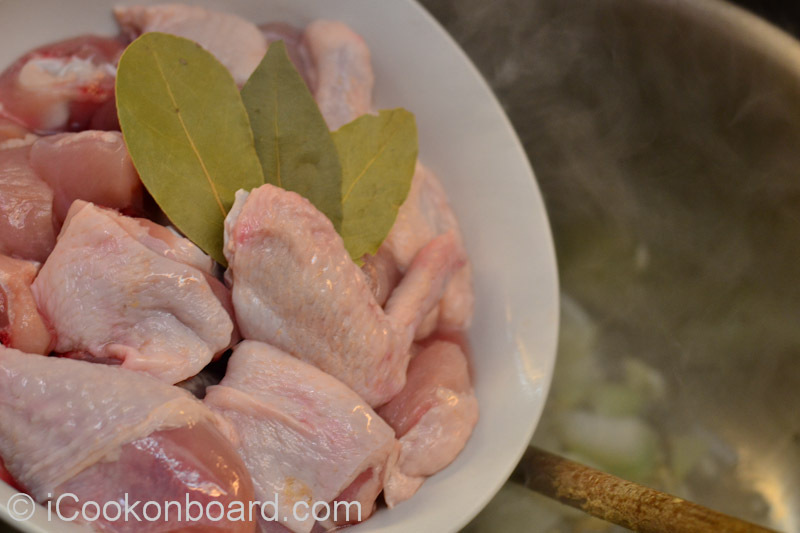 Season with salt and freshly ground pepper to taste. Take out from heat, keep covered for 5 minutes more. 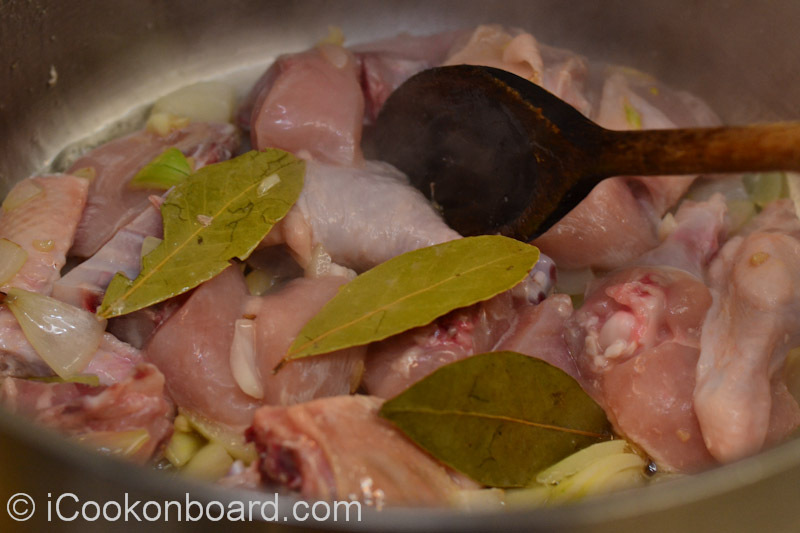 Stir garlic and onions for awhile, then add chicken and bayleaf. Stir and cover for 2minutes. 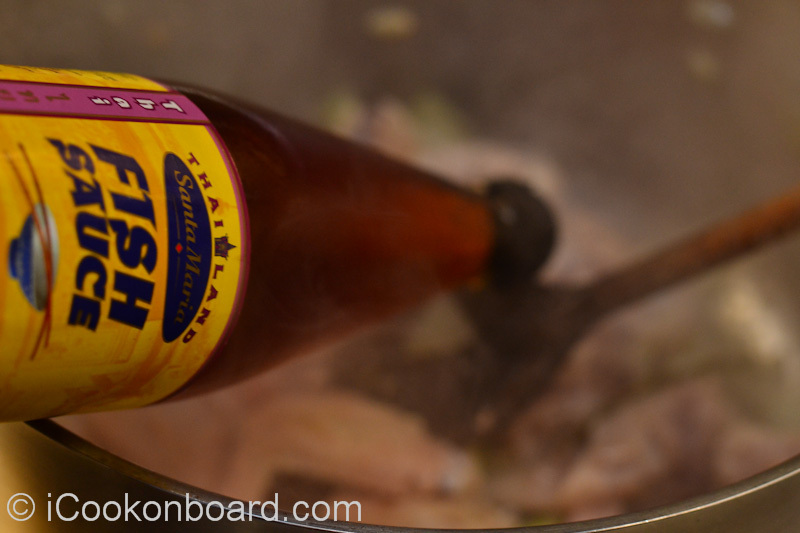 Pour fishsauce and stir chicken. Return lid and cover for 3minutes. 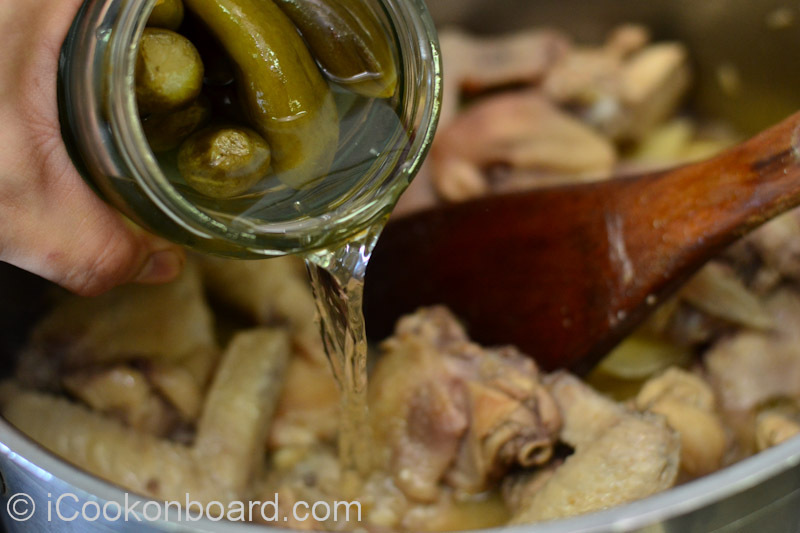 Reduce heat to medium-high, pour the juice of sweet whole pickles. Cover for another 10 minutes. Cover and turn heat to low. Potato must be soft and ready after 10minutes. 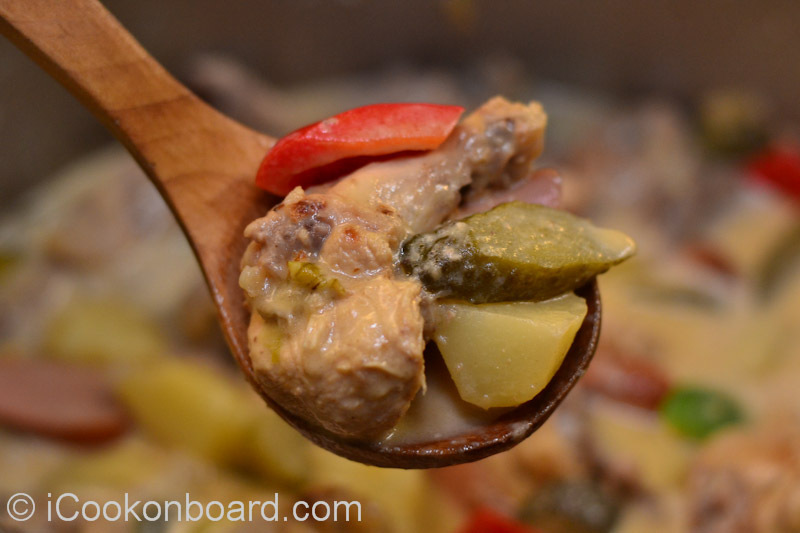 cooking Manok sa Pickles for your crew onboard or for your family and loved ones at home. 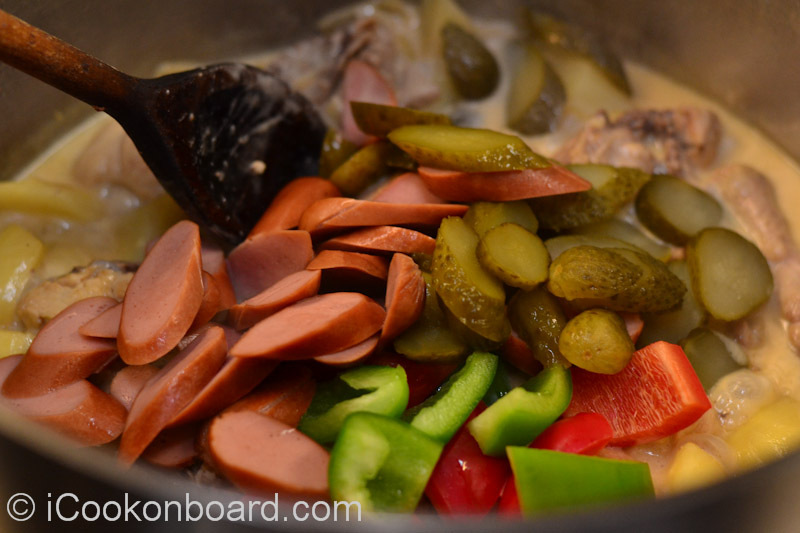 Thank you for sharing the recipe,,,how much pickles do you put if you are cooking 2 kgs of chicken? I think I can get RAM pickles here but I do not know which size to get. Thanks. Thank you too! I can suggest you to buy a 500grams jar or Whole Sweet Pickles. You can use 3/4 to 1 cup of sweet syrup and 4pcs. whole Sweet Pickles, diagonally sliced. I hope my suggestions help you! I remember my Mom making this sans the cream and I was craving to taste it again. Thanks for sharing your recipe. Hi.. It so happened dat im looking for this recipe.. I was delighted seing the word BINAN.. Thinking dat for sure its lutong tagalog.. I read it.. I got more delighted knowing ur from san vicente also.. Im from don pablo subd.. Dats i decided to follow you..
Hello! I’m glad you stumble upon my blog. Yes, I grew up in Ferlins Subd. So we must have seen each other before or maybe we share some common friends. Looks quite delicious. I’m going to try to make this when i can. Looks like a very straightforward dish. Gotta love easy prep, easy cook dishes. It looks delicious too! Off looking for pickles…I hope to find RAM brand here in Taiwan.